I apologise in advance as you’ll probably have that song in your head for at least the rest of the day now! Hi there, today I’m sharing this card that I made for my niece and nephew to give to my Dad for Father’s Day. The ‘Ghostbuster’s’ reference is a little family joke regarding my Dad’s new-found appreciation for that catchy tune – which would you believe – is nearly 32 years old!!! That means that I was the same age as my daughter is now when that came out – eek! He plays it so loud – on purpose – in his car when he comes round to our house, mainly I think to try and embarrass me in front of my neighbours! 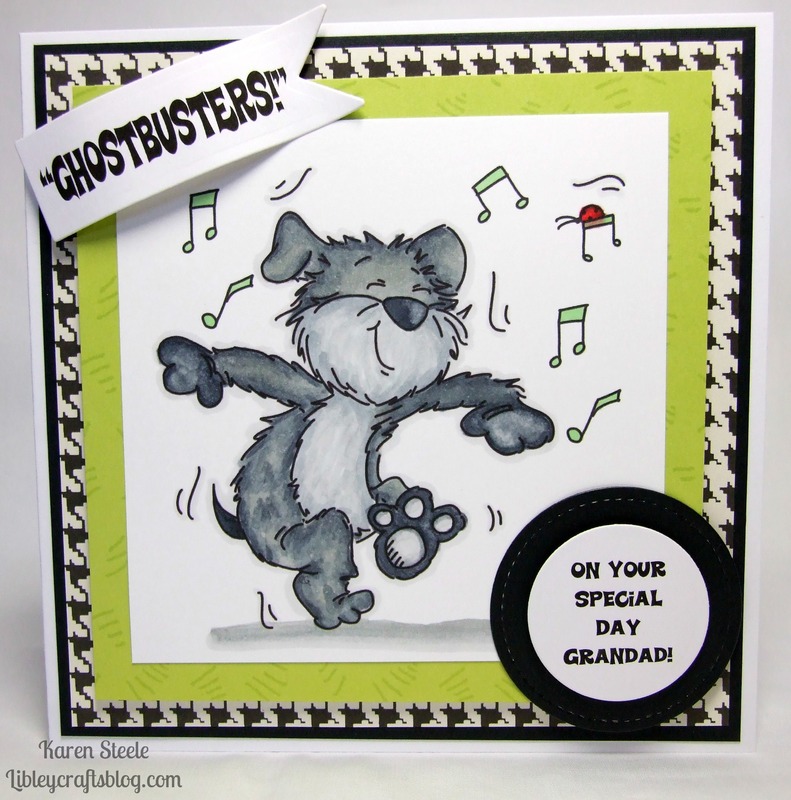 Anyway I thought this digi from Sassy Cheryl’s Stamps would be ideal for him along with the sentiment that I made up on the computer! This cute little image is called Don’t Stop the Music! I teamed it up with papers from Anna Griffin – Fifi and Fido collection, black card stock, Spectrum Noirs and Spellbinders Circle and Banner dies. My sister gave him a Ghostbusters t-shirt as a little jokey gift too, unaware when she bought it that I had included the theme on his card – spooky……!!! Next > Hunkydory – Cute Kitties and Precious Pooches….. There is something strange in my neighbourhood every day, but that’s London for you! Love this. It’s so nice, but not easy, to be able to make something truly personal but also so good! This is so sweet – and you’re right about the song! Fun card Karen!! FUN card and great story !